Leicester City boss Martin Allen has left the club by mutual consent after just three months at the helm. The former Brentford and MK Dons manager signed a three-year deal in May, but his relationship with chairman Milan Mandaric quickly deteriorated. "Given our respective visions for the club, it was decided that it would be in everybody's best interests if we parted company," said Mandaric. Last week, Allen insisted speculation about his future was "rubbish". But a statement on the club website openly admitted that "differences between both parties regarding the direction of the club have led to a breakdown in the relationship". The Foxes have appointed academy manager Jon Rudkin, coach Steve Beaglehole and goalkeeping coach Mike Stowell to take charge of the first team on a caretaker basis. But Leicester said they do not have an immediate replacement lined up, contrary to speculation linking them with former Sheffield United boss Neil Warnock. Allen was in charge for three Championship matches - winning one - and Tuesday's abandoned Carling Cup tie against Nottingham Forest. The 42-year-old was given substantial funds to spend over the summer, including £2.1m on striker DJ Campbell, while Stephen Clemence, Bruno N'Gotty and Shaun Newton also moved to the Walkers Stadium. 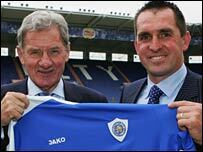 Mandaric took full control of Leicester in March, and immediately announced plans to return the club to the Premiership within three years.